An abstract game for 2 players by Dieter Stein. 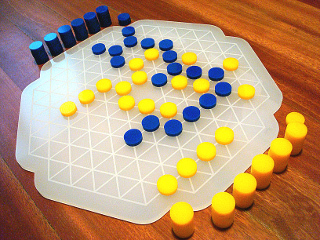 VOLO is an abstract game with placement, movement, connection, and territory elements. Inspired by the beauty of birds flying in flocks. VOLO is played on an hexagonal board with 120 spaces. Each player in turn places or moves playing pieces (here called "birds") on the board and attempts to connect them all in one contiguous "flock". Birds may not placed directly adjacent to other friendly birds and may only move (i.e. "fly") towards other birds if they enlarge an existing friendly flock. Flocks may never be split, so players are forced to add new birds to the game, and this is actually where the competition unfolds. If opponent birds are isolated, they are removed from the board, which is usually beneficial for the opponent player. If a player ends up with one contiguous flock (of any size) they win the game. Components: 45x33x5 paperstock box, board, 50 yellow discs, 50 blue discs, white bag. The board is made of 8mm thick laser-cut 'ice' acrylic (and engraved). The discs are made of 6 mm thick laser-cut acrylic. The basic edition is also available here.